4 photographic prints : col and b&w; ; 5 x 7 in. 4 negatives : col. and b&w; ; 120 mm. Published in Rafu Shimpo, February 11, 1967, Japanese section. Kenji Ito takes a pilot license test in white and blue Piper Cherokee 140 airplane on tarmac, California, 1967. Ito has a thin mustache and wears eyeglasses and a brown jacket over shirt and necktie. 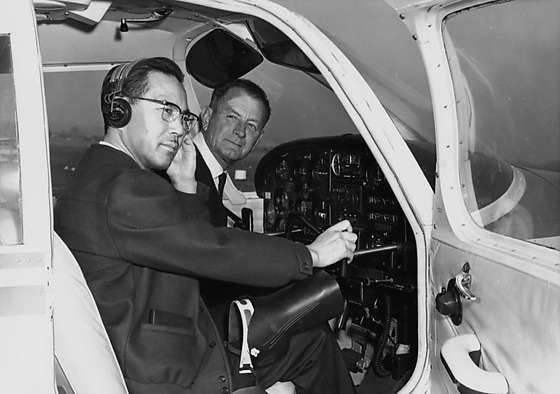 4P and 8N: Ito sits in cockpit wearing headset next to Caucasian man. Door is open. Typed on original envelope: Kenji Ito with Airplane.